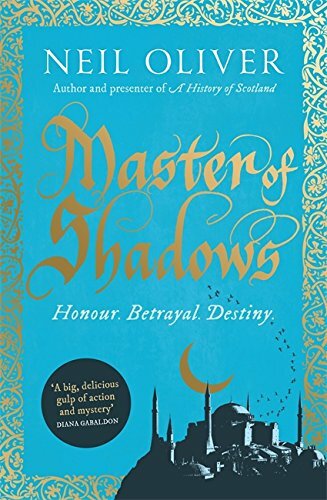 Master of Shadows starts with a historical note about 1453 and the advance of the Ottomans on the eastern Christian empire of Constantinople. Rumoured to be among the city’s defenders was a Scot called John Grant. Neil Oliver – historian and TV presenter – takes the real life Grant and fictionalizes him in this, his debut novel; a novel rich in detail, historical context, colours and smells. It starts with disparate snapshots: a boy lies in a meadow and feels invisible; a stranger arrives at a Scottish village; a woman, chopping wood, feels threatened; a young girl leaps from a high wall, expecting to die. A Moorish solider, tall and imposing with his curved blade, arrives in Scotland at the castle of a Lord. Secretly he is seeking a specific woman. He had fought in wars alongside her husband and promised to keep her and their son safe if he should die. Badr becomes a surrogate father to the boy and teaches him everything he knows, later they fight side-by-side in battle. Leña lives amongst nuns. Given her name – which means ‘firewood’ in Spanish – I thought was a Spanish woman but in the memories of her childhood we learn she, too, has been to Scotland, and speaks French. So the mystery continues. The storylines are many and intriguing and for a long time I puzzled over how they connected. It is a story about the connections of blood, the duty owed to family. It is a long book (448 pages) but never seemed so long to be off-putting. There were passages a little too ‘history heavy’ for me, but I’m sure some readers will gobble it up. All-in-all, a great debut. Not all historians can tell a page-turning fictional story, for some it takes three or four novels before they hit their stride, so I’m looking forward to Oliver’s next novel. Follow Neil Oliver on Twitter or check out his website.